There was a revolution in the comics industry in the 1980s. People were moving away from mainstream superhero narratives and toward dark, gritty, alternative stories. Speedy Ortiz is a secondary character in Love and Rockets, one of the first series in the underground comics shift. The comics tell the story of a group of Chicano characters from Latin America and then California, and involve punk rock, time jumps, sci-fi, magic and gangs. Speedy is a young, tough, violent and surprisingly sensitive gang member—so it’s only fitting that Sadie Dupuis would name her band after such a colorful guy. 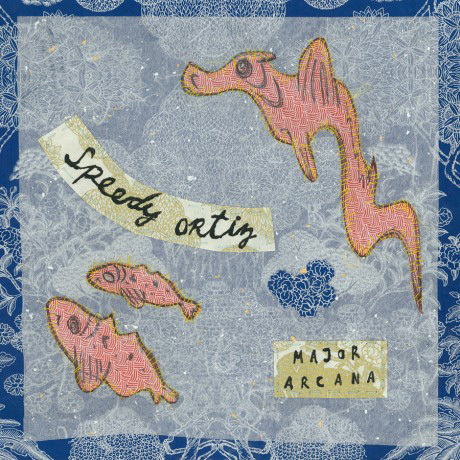 Although, according to Dupuis, “I just typed it into iTunes after recording some solo tracks…it wasn’t meant to be a permanent name.” The name stuck and now Speedy Ortiz—the band—has one of the most acclaimed albums of the summer with their LP, Major Arcana (our review). 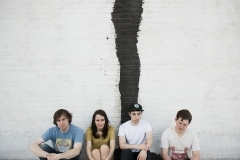 What began as Dupuis’ solo project, full of clever lyrics and familiar sounds, has grown to include three other members: Mike Falcone, Darl Ferm and Matt Robidoux. 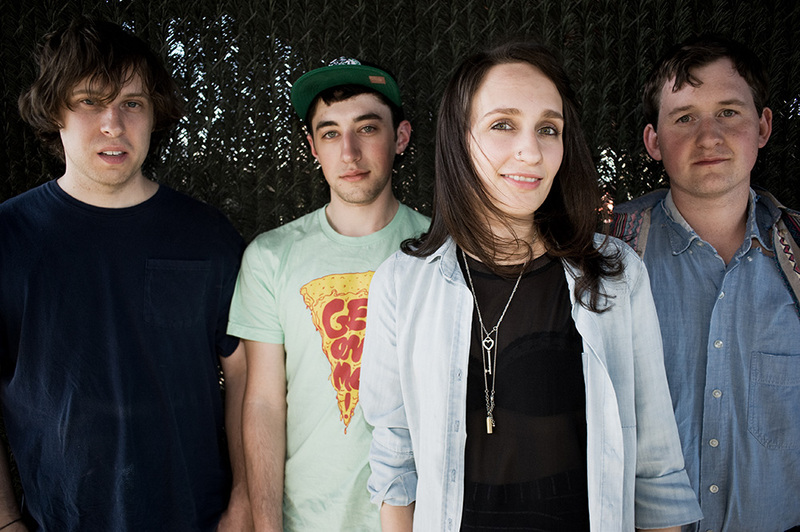 Despite being compared to bands of the 90s, with similar sounds and Liz Phair’s witty lyrics, Speedy Ortiz is a wholly original band. The first time I heard their now famous song, “Taylor Swift,” I jumped at the title and appreciated the wordplay. The music combines its anxiety with a very particular cool. I spoke with Sadie last month to talk about the evolution of Speedy Ortiz, performing live and the impact DIY culture has had on the band. The Fiddleback: Growing up, what role did the arts play in your life? Sadie Dupuis: My mom was (and is) a visual artist, mostly working in oil paints, and she encouraged me to try out many kinds of arts. So I dabbled in writing poems and little stories, drew comic books, painted, acted in theater and even a commercial, danced ballet and modern, sewed. A lot of these were kind of short lived hobbies, maybe just a year or two of semi-intense interest. Going to an arts camp with open studios helped facilitate a lot of interests I’d otherwise never discover (like glassblowing). Music was always a consistent passion, though, and I always wrote songs, so I guess it makes sense I still gravitate towards that medium above the others. The Fiddleback: Being a poet and currently enrolled in a university, does your schooling influence your music at all? SD: I’ve been lucky to have a variety of different educations. Finishing up high school, I thought I would pursue a career related to math, so I wound up at MIT. But math wasn’t really for me, so I wound up studying music history and non-fiction writing instead. I took a poetry class there with Bill Corbett, who became sort of a mentor/role model, and decided to pursue writing more seriously, taking time off to work as a music journalist. Eventually I transferred to Barnard College and took poetry workshops with Saskia Hamilton, Timothy Donnelly, and Josh Bell, all of whom were very inspirational. And now I’m getting my MFA in poetry, studying with Peter Gizzi and Dara Wier and James Tate, all of them heroes to me. I don’t know that any of them influence my music directly so much as they influence me as a person overall, and my music is a product of who I am. The Fiddleback: Starting out in Northampton, did the Massachusetts music scene influence you in any way? SD: I started this band just a few months after moving to Northampton and it began as a solo project, sort of in a vacuum, so I was probably more inspired by the artists I knew before coming here. 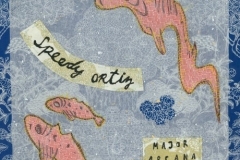 But I was already very drawn to and inspired by a bunch of Boston bands—Grass is Green, Pile, Krill, etc. The Fiddleback: Why did you decide to move away from working solo to working with band members? What has the transition been like? SD: I have terrible anxiety performing solo so I asked some friends—Matt, Mike and Darl—to help me out playing my solo project songs while my full-time band, Quilty, was going on hiatus. We liked the line-up so much that eventually we started working on the songs together and now everyone is involved in the performance and arranging and production. It wasn’t really much of a transition, as I was used to playing with bands. I’m a really horrible solo performer, so I almost never agree to play that way, and I never played solo under the Speedy Ortiz name other than on those home recordings. It would feel incredibly sterile to only play to blasé crowds at 21+ clubs forever, and we’d probably prefer to play only basements and houses if that were at all lucrative. The Fiddleback: Your sound is both new and familiar and reminiscent of the 90s. How do you find a balance between the two and keep your sound fresh and original? SD: I don’t have any particular decade in mind when I write songs, just melodies and arrangements that pop into my head. I think the production we favor–dry vocals, quiet-to-heavy guitars–seems like a throwback to people who are used to the recent trend in rock music that is so drenched in reverb that guitar and vocal notes become indistinguishable from one another. But that kind of sound really isn’t for me. The Fiddleback: What’s your writing process like? SD: Usually I work on a demo at home, recording guitar and vocals and sometimes bass and drums. Then we learn the songs together, tweak the arrangements, play them out a few times, and make adjustments along the way accordingly. Sometimes we make a demo of us all playing together. Eventually we record for real in a studio. Even after those recordings come out, we still make modifications to how the live performance will be, so the songs stay fresh to us. The Fiddleback: The lyrics are the heart and soul of the music. Where do you draw your inspiration from? Is there a particular song that’s your favorite, lyrically? SD: A lot of it is associational, freeplayful, sound based. I write the music first and lyrics second so I try to find words and themes that fit the tone of the song. Most of the songs are personal, but I try not to write them in a way that’s obviously autobiographical or narrative. I don’t know that it’s my favorite, but “Gary” is kind of fun to sing because it came from a fairly vindictive place and is a good reminder to get over my old harsh feelings. The Fiddleback: What was recording process for Major Arcana like? SD: We worked with Justin Pizzoferrato on it, who had mixed all of our previous releases. We came in to his studio Sonelab on a Tuesday and just kind of just played our songs live every day and Justin recorded it all and made it sound great, and very representative of what we sound like live. We wrapped the session on a Friday, because Justin had to go down to New York the next afternoon to record the Dinosaur Jr. 25th anniversary show. But I happened to stayed up ‘til 5 a.m. listening to the rough mixes and came up with all these ideas for overdubs that seemed absolutely necessary, and sent Justin a frantic e-mail with a list of them to see if we could make it happen. So we worked for three hours the next morning to get these last minute backing vocals and guitars and pianos on the record. Now that those parts are on the songs I can’t imagine them without, even though they aren’t there when we play live. The Fiddleback: The DIY movement played a large role in getting the band its exposure. How did you go about that and what does it mean to you? SD: Booking my own shows and playing at DIY and all-ages spaces has been a part of my musical life since I was a teen, playing church basements and VFWs and friend’s houses. 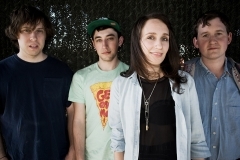 We played (and continue to play) DIY shows in Speedy Ortiz because those are the kind of shows we like going to see. I’m much more excited to go to shows that are all-ages and community-oriented, partially because they’re more inclusive, partially because non-commercial art that springs out of local scenes is way more interesting than stuff that gets attention on a national level. It would feel incredibly sterile to only play to blasé crowds at 21+ clubs forever, and we’d probably prefer to play only basements and houses if that were at all lucrative. Unfortunately, it isn’t very lucrative, and we have no interest in taking any kind of corporate money, so we have to play a balance of houses and clubs. We have a booking agent now, but are still incredibly picky and hands on about where and who we play with, and making sure ticket prices are as low as possible, and that the ethics of the club are okay. And if we have the option, we always gravitate toward DIY spots. I would probably quit if it weren’t that way. I think we all would. 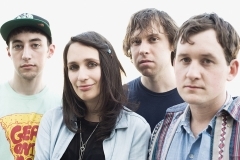 The Fiddleback: What’s next for Speedy Ortiz? SD: Recording a new EP next month!